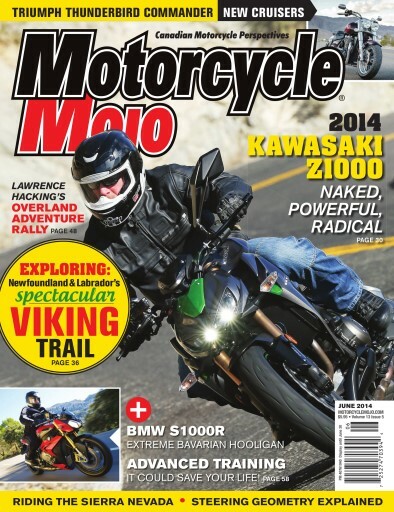 Our June issue features a pair of naked Streetfighters – the superbike-derived BMW S1000R and the fourth generation, sugomi-inspired Kawasaki Z1000. In addition to the Streetfighters, and at the opposite end of the two-wheeled scale, we test Triumph’s newest cruisers, the Thunderbird Commander and the Commander LT. In travel, we have a report of riding the Viking Trail on Newfoundland’s Northern Peninsula. The Viking Trail gets is name from the Viking village that was settled roughly one thousand years ago making it the earliest evidence of Europeans in the western hemisphere. Liz Jansen reports about her travels on the other side of the continent in Carson Valley, located in the Sierra Nevada Mountains, just south of Lake Tahoe, California. All this plus much, much more.